The first Friday of June has come to be celebrated as National Doughnut Day, and New Yorkers looking to celebrate won't have to venture more than a few subway stops for some of the best doughnuts in the country. City guide app Foursquare put out a list of the top 20 doughnut spots in America, and four New York City shops grace the list, with three dynamo local doughnut shops squeezing into the top five. Dough, a delectable spot on Franklin Avenue in Bedford-Stuyvesant, Brooklyn known for its oversized doughnuts and unique flavor combinations, such as blood orange, takes top honors on Foursquare's list. Doughnut Plant's location on the Lower East Side ame in No. 3, Reviews on the city guide app laud the spot's tres leches and chocolate doughnuts, and warn naysayers they "donut" tolerate any disagreement. Rounding out the top five is Peter Pan Donut & Pastry Shop on Manhattan Avenue in Greenpoint, Brooklyn, which offers a coconut crusted doughnut that patrons swear gives them a whole new perspective on life. 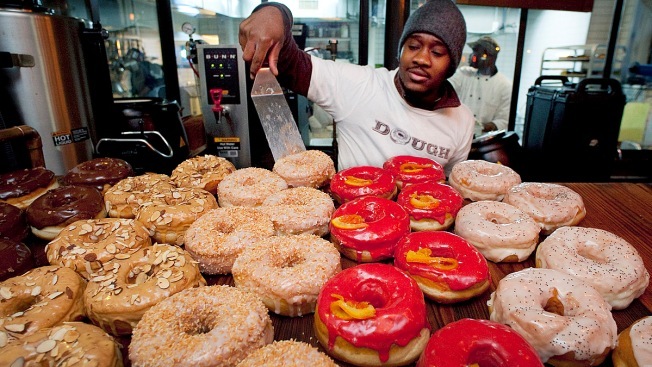 Dun-Well Doughnuts in East Williamsburg also made the list at No. 12. The rankings listed the top-rated locations for donuts across the country using Foursquare data.